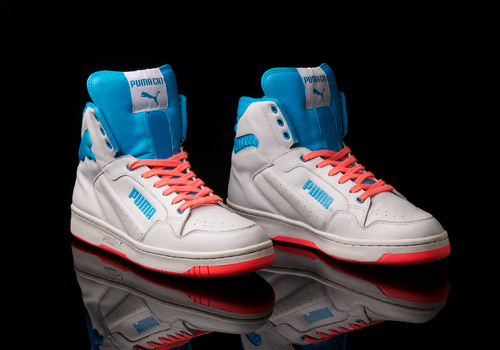 We’ve rescued, written about, and reviewed a lot of different PUMA Cat Hi’s and it’s exciting the variety of colorways that they can be found in. 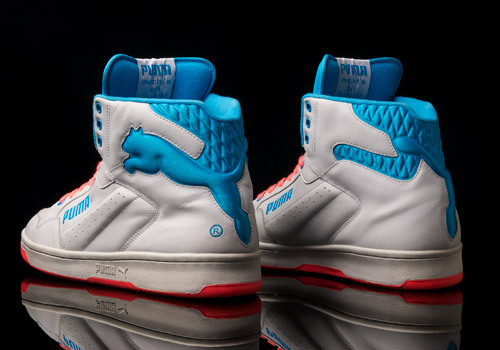 Almost as though it were some sort of jungle rainbow, the imagination of the designers behind the many variations of the PUMA Cat high top is explicitly delicious. Off the tip of our tongues we can name a range of saucy mixtures, such as black with green and yellow, black with purple and yellow, black with grey and white, white with black and red, red with black and orange, and the list goes on and on. These 2004 released “lilac” and teal pair remind us very much of the also ’04 white with purple and “lime” green pair, both excellent choices for a spring or summer shoe. 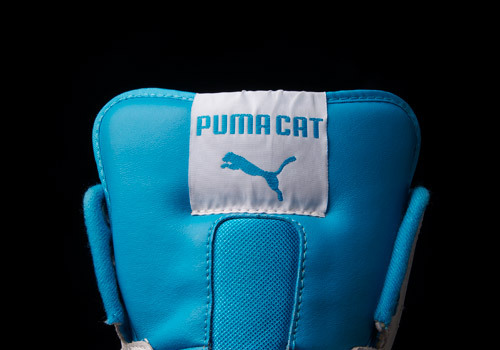 The key about the PUMA Cat isn’t just the great build and durability (though that’s there too) but it’s the design itself. It literally lends its shape so readily to the idea of mixing and matching colorways that push and pop the emotions of onlookers nearby. 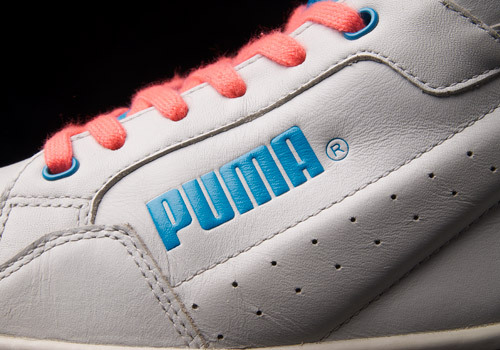 This is quite similar to a variety of steadfast classics from PUMA’s past and present, such as the Clyde or Suede or States, which frequently keep things simple and clean by experimenting with only two or so colors in one version at a time, a nice contrast or a calming blend to bring the connoisseurs and casual consumers both into the shop for a purchase. 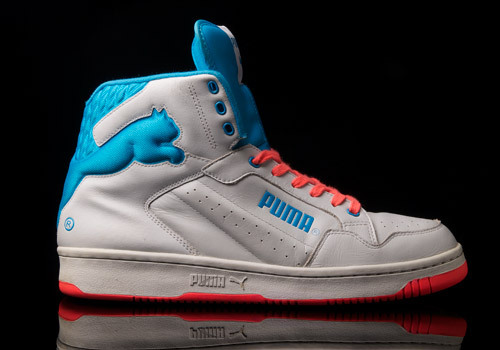 With this leaping cat literally enacted as part of the shoe’s back body, a vast majority of the upper can be curated with a startling or stark hue to outline the shape of the company’s iconic character. The large tongues and (frequently) bright sole units also reinforce the reactive effect of their treatment. And the fun doesn’t stop there, as the even the laces come into play – certainly one of my favorite parts – allowing a full lace up to the tongue to look great when the colors are matching, or a fat, loose pop of the tongue when one chooses an alternative lace color (as pictured here). 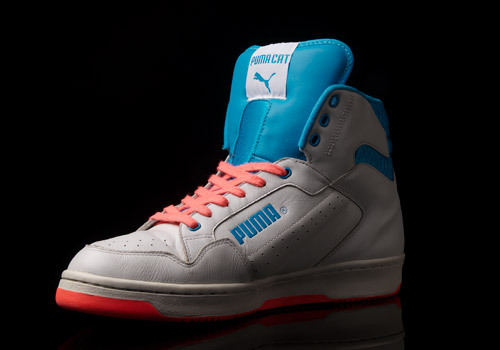 However you wear them, the point is that it’s not just the fit and feel which leads them to shout out loud from your feet, but it’s those ice cream, spaceship, old school, late ’80s rainbow hues that truly bring the shoe its shine. Now hopefully we can remind PUMA that it’s just about that time again to cook up a few new batches of PUMA Cats because any day now we’re simply afraid we’re gonna run out of new colorways to discover. Sigh. 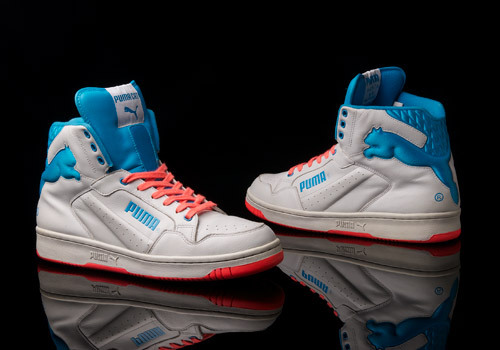 What I wouldn’t do to own a pair of these! I own a pair in US 8.5 (UK7.5 / EU 41). interested, please let me know! I own them in 8.5. Let me know if you are interested! Hi Marcus, I own a a pair in US 8.5. Are you interested?